Midnight Scooper is the September winner of our “Startup Of The Month” prize. See past winners here. Anyone who has ever scooped ice cream straight out of the freezer, knows the pain of jabbing the scooper in as deeply as you can, chiseling off bits and pieces like a stone-mason. Finally an engineering student from UCSD, Michael Chou, has solved the scooper problem. By adjusting the handle of his scooper, he has created a scooper that flies through ice-cream, making beautiful scoops – pain-free. Chou is selling his solution, known as the Midnight Scooper (named for the long nights he spent building this scooper), via a Kickstarter project that has already exceeded its $17,500 goal by 125% ($40,144 to date). Along with the redesigned handle, the scooper also has a redesigned, specially curved, sharp front edge, to make cutting through ice-cream “like butter”. According to Chou, “The magic is in the handle. 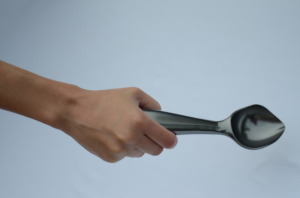 The ergonomically shaped curved of the handle lets you push the Midnight Scoop with your palms. Your wrist are kept straight and protected. The handle is also long enough to help you reach all parts of a giant container of ice cream yet narrow enough to fit inside small pint size containers just as well”. As of this article, readers still have 7 days to pick up a Midnight Scooper at a $15 discount – for $35. Of course, you won’t receive your scooper until at least December, when Chou expects to begin fulfillment. If you really want one next week, you can fork over $1,000 for one special pink scooper – though that seems a bit excessive.